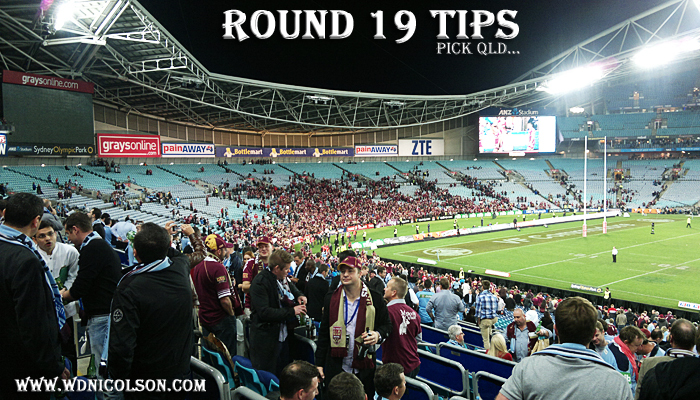 The advice has been simple... if you are in tipping contention at this time of year - tip favourites. Sticking to that philosophy you tip 6/8 in Round 20... with only the Broncos and Warriors hurting you - that's very handy form at this time of year. So it bears repeating - stick with the favourites if you are in with a chance in a tipping comp. By all means pick the slight outsider like the Broncos were v North Queensland, or the Warriors at home v Melbourne but if you picked the Knights over the Roosters or Dragons over the Raiders - you either can't read a ladder or foolishly don't believe in hoodoos. This week there are a number of fairly even matchups - so be smart, pick the favourites and if you must - take an upset in one game (maybe maybe maybe two)... but any more than that and you might cancel out any gains you get with dumb picks that lose you ground. I won a BBQ in 2010 remember... this proven strategy is how you win a Weber people! Anyhoo for the final week - there are two features on www.nrl.com that are worth checking out and another two on the way Thursday. Latest of Late Mail and Round 21 Tips below! 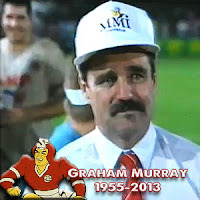 It was with a heavy heart that I read and then posted about the death of former Rugby League coach Graham Murray last night. "Muzza" to many who knew him personally, died of heart complications on Sunday night at the age of 58 in a Brisbane hospital surrounded by family. He had a celebrated coaching career spanning five first grade teams, spent time across two continents and took charge of one state and a couple of pacific nations. All this coming after he was a first grade player with Parramatta and South Sydney in the late 1970s to early 1980s. Sadly I never met the man who took the Leeds Rhinos in 1998, the Sydney Roosters in 2000 and the North Queensland Cowboys in 2005 to Grand Finals but the one team I always think of when I hear Murray's name - is the Illawarra Steelers, who Murray came perilously close to leading to a Grand Final in 1992. Rod Wishart, Paul McGregor, John Simon, Neil Piccinelli, John Cross, Ian Russell and Brett Rodwell are the players identified as Steelers most commonly but I rate Murray ahead of them all as Steelers. He was the guy who turned a team that had struggled to a single meaningful appearance in their first decade (a heart-breaking Panasonic Cup Final loss to Wally Lewis and his star-studded Broncos in 1989 with UK import Andy Gregory pulling the strings) - into a team that if not for the awesome era of great teams in the early to mid-1990s, should have featured in more than just one Finals Series in 1992. In fact, I still consider the 1994 team the best Steelers side I ever saw play. But for me Murray - the man with the glorious moustache - was the Illawarra Steelers. Here is a summary of Murray's seasons as Illawarra head coach from 1991 through to the first month of 1995. Season 1991 saw Murray take over from Ron Hilditch as head coach and he built on a promising 11-10-1 record in 1990 that season that saw the Steelers finish 9th. Murray's troops finished 8th on the competition ladder in 1991 thanks largely to the form of a winger - yes a winger, as Alan McIndoe (returning from a two season stint at the Penrith Panthers) crossing the stripe a club record 19 times in 21 games as Illawarra. Murray also oversaw the collation of an emerging core of Steelers - all in their early to mid-20s and gave more responsibility to 19 year old John Simon at halfback (only his second full year of first grade). The Steelers won 10 of their 11 home games at the Wollongong Showground that season, and despite winning 4 of their last 6 games, missed the Finals by 2 points with a 12-9-1 record. The Steelers were one of only three teams to concede under 300 points (3rd with 291 points against - allowing only 10.3 points against at home), yet played attacking football under Murray - finishing with the 5th best attack with 451 points for. While it was hoped that by now the style of the content you read here at www.wdnicolson.com would be helping bring www.nrl.com into the sphere of a 'can't miss 3 or 4 times a day' website... some of it is gradually breaking through of late. But baby steps people... baby steps. What you see regularly on www.wdnicolson.com are two or three things a week that we think you've shown us via our stats that you WANT. But by absolutely no measure are they the only things we would like to produce for you. There simply isn't the time to do what we are SURE you want as well, just haven't been given access to before. 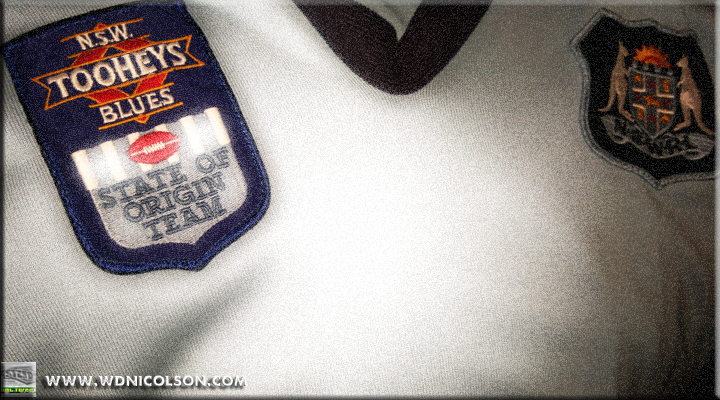 Stick with us and hopefully the tide will start to change on the NRL front... maybe even come the Finals this season. Anyhoo there are two features already on www.nrl.com that are worth checking out and another two on the way Thursday. Okay okay, let's just get to the tips and the real reason each and every one of you are here for: The Latest of Late Mail! This is a regular feature on www.wdnicolson.com - every week we will post a Set of 6 Tackles that form a Complete Set by the end of the Round. 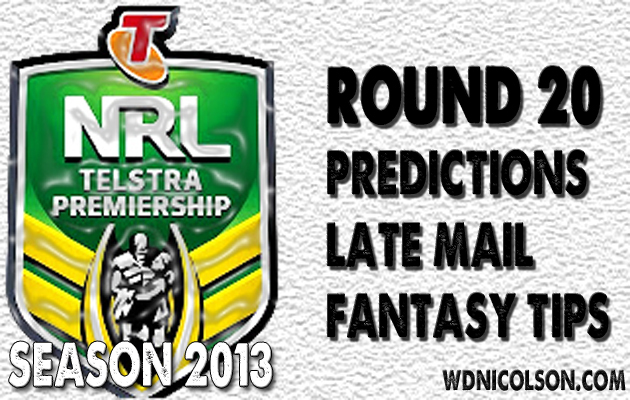 It also features Votes from Round 19 of The @NRLTweet Player of the Year Awards. A tip of the hat to the SMH's 'Set of 6' and Andy Wilson's 'Set of 6' for the various names this column runs under... and we'll call it flattery that you've already used it. If you haven't noticed already the @NRL Twitter Account has come to life over the course of the weekend's games since early June and the overwhelming reaction has been positive. But of course - there is always one or two individuals who just can't seem to fathom that what they say they don't like is what a lot of other people like. During Round 19 - I have taken the reigns for every game this weekend and I am extremely cautious in how much I tweet from the account during a game. I want to add to the experience you have either at the game (if you can get mobile reception! ), at home with the TV on and the laptop or phone in hand or if you are unable to watch the game and want score updates on the run - mixed with a little bit of energy and observation. I only tweet multiple times within a few minutes when there is a try scored or the Video Referee is called upon. 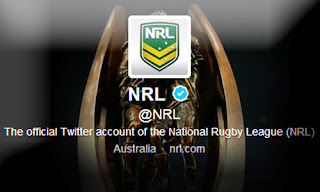 So when I saw one person tweet 'I find it annoying that the @NRL account is live tweeting games now... that's what a blog is for' - I shook my head. What is the point of building up a 100,000+ strong followership for @NRL without reaching out to it at the times they are most likely to be wanting information? PLAYER OF THE SERIES: Thurston takes the Daley-Lewis Medal. 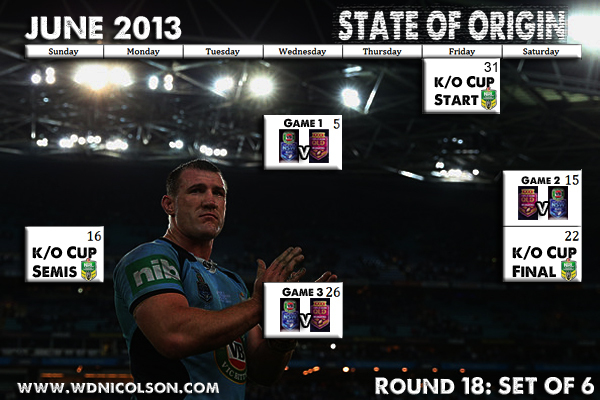 With QLD taking the 2013 Origin Series - their 8th straight by the way... here is a look at the Series leaderboard in the The @NRLTweet Origin Player of the Series. 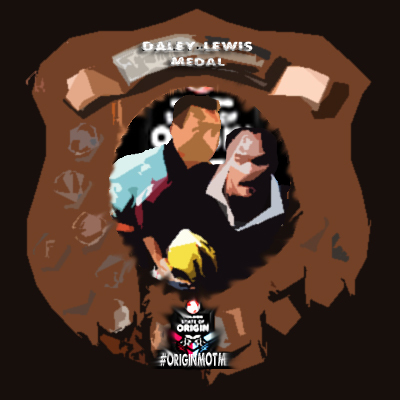 We reveal the Daley-Lewis Medal winner after tallying up all 3 games and announce our Man of the Match Votes from Origin 3. In the end NSW came up short in this department once again and Queensland's galaxy of stars did the job when it mattered in Game 3 of the 2013 Origin Series. Chief amongst those who stepped up was QLD five-eighth Johnathan Thurston - who took out the Daley-Lewis Medal as the Player of the State of Origin Series for 2013. And like the two players the Medal is named after - Johnathan Thurston is: CLASS. So enough about this useless Origin concept okay? We are all a bit bored with the way the State of Origin Series continues to build up to the max then majorly disappoint at least one state involved in proceedings.... right? NSW will never get a better chance at breaking the streak than they did in 2013... they were by far the better team in Game 1 and throughout the Series - Greg Inglis was hardly a factor... and Greg Inglis is the best big game player in Rugby League. Mitchell Pearce cops a lot from fans and the media alike... win a series with your ability and they might shut up. As of yet - that seems beyond him. He's a good footy player but with Jarryd Hayne missing for NSW - he had to be a great one on Wednesday night... and for the 13 games he has represented NSW - he hasn't been a great player. It is time to move on boys and girls. 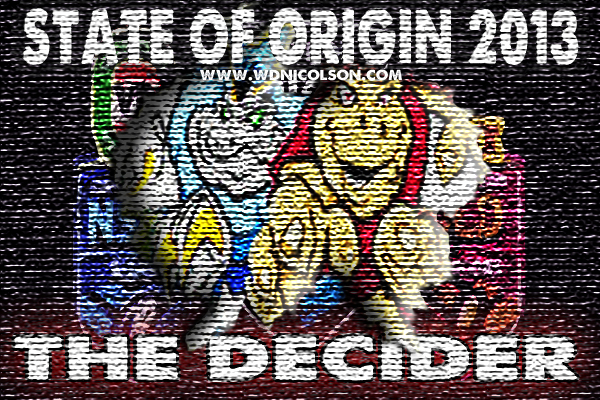 THE DECIDER: Yes... NSW can win The Decider tonight. 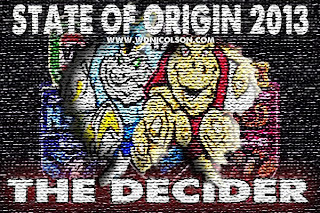 The DECIDER is TONIGHT at a sold-out ANZ Stadium - so www.wdnicolson.com gives you 3 reasons why NSW should enter this game thinking they can win. NSW can win Game 3 tonight at ANZ Stadium and end a painfully long series drought at the hands of what has been a superior QLD team. I'm going on record - tonight's DECIDER is winnable. But if NSW do pull off what is becoming an increasingly impossible task (news through this morning Luke Lewis's shoulder is not good) - they have to take care of ALL three areas of the game below. One or two won't cut it - all three have to mesh in Game 3 for QLD to finally be vanquished as State of Origin Champions. And although NSW start as $2.50 outsiders... at home in Game 3 - I sincerely think that if the Blues show up and take care of the 3 factors below, they are an even money chance against the greatness that is QLD's current core. Game 1 was won by NSW in the first two sets... Game 2 was won by QLD in the first two sets... Surely neither side's forward pack will roll over and let Game 3 be won in the first two sets? NSW's starting team has a big job to nullify Matt Scott, Nate Myles, Corey Parker and Sam Thaiday's go-forward... but the bench of Andrew Fifita, Trent Merrin, Boyd Cordner and Anthony Watmough probably have a more important job of getting NSW the ascendancy when they come into the game against the QLD bench. If NSW want to give themselves every chance of victory - they MUST dominate when the bench comes into play... so Andrew Fifita - the time is now sunshine to turn club form into Origin form. He is the key to this factor - and watch for the NSW halves to sniff around him for an offload. Jennings, McManus and the Morris twins must take their chances and finish. They might only get 2 or 3 quality chances all night - but they must take full advantage and get NSW points. If NSW blow chance after chance early... QLD will punish them. And if any of the backs get into the clear (especially Josh Dugan) - they must look for James Maloney and Mitchell Pearce backing up as they are natural support players. Don't blow chances NSW... or you blow the series. His name is Robbie Farah and boy - he's got his work cut out for him. He's good enough people... but if the NSW pack play like they did in Game 2 and shy away from matching QLD's intensity (that will be there in Game 3 like it was in Game 2)... then Farah won't get the chance. 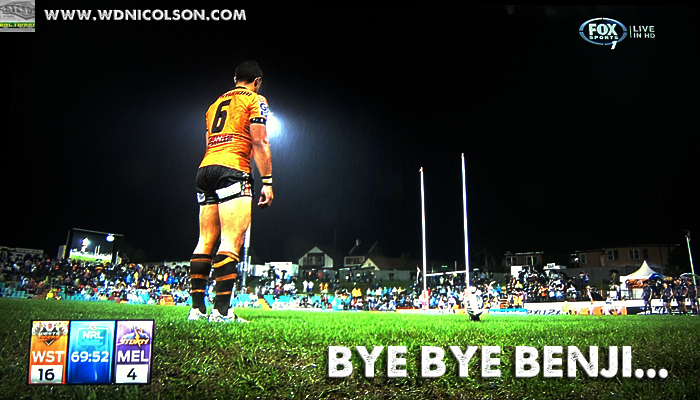 Forget Pearce, forget Maloney, forget Dugan... If The Decider is won by NSW it will be because of the forward pack and the genius of Farah. 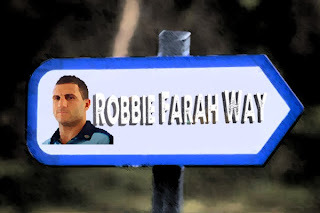 But without Hayne - NSW just saw a number of possible avenues to points become a one way street called Robbie Farah Way. ... Okay there is a 4th factor... QLD must not play their best... because if they do - NSW without Hayne can't match them for class. Here's a tip... don't change your tip. If you are counting at home - the two games I chose not to change in the hour before the game saw me lose both tips, and the game I did change - I lost again. Stick with your gut and it hurts less. Believe me. Just 4 games this weekend with Origin 3 next Wednesday so there's not a great deal of Late Mail to report, but report it we will. Here we are... the non-event that was the Australian Tour of India is thankfully long forgotten, and the Australian Cricket Team will take on the old (but far superior lately) foe of England for the 2013 Ashes Series in England. England have won the Ashes in England 2005-2009-? So to the actual 2013 Series - who wins? Australia have the game's best player in Michael Clarke... and England have perhaps 3 or 4 of the 10 best in the world. So in this case - the old adage of 'A Champion Team will always beat a Team of Champions' applies to England on both counts right? 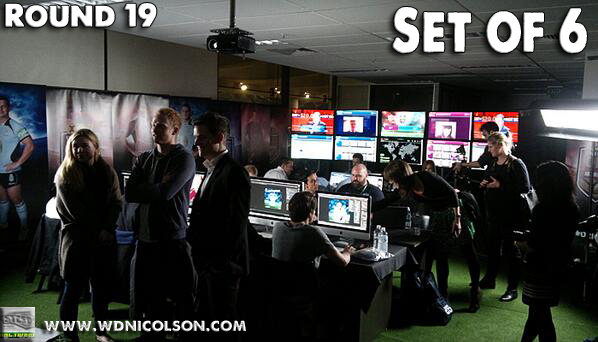 We shall see... below is www.wdnicolson.com's Keys to the Series and 5 Test Predictions. 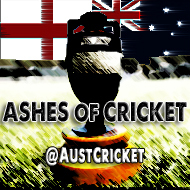 You can follow our in-Test Tweets during the Series @AustCricket or below in the widget and note that the official hashtag on Twitter is #Ashes. If you have any questions or comments you want to pass on during the series grab me on Twitter.